Country Foot Care > FAQs > Sports Injuries > How Often to Replace Running Shoes? How Often to Replace Running Shoes? 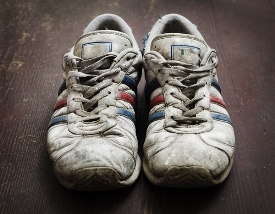 You need to replace running shoes when they are worn out. Most runners wait far too long to do this and risk overuse injuries as a result. Running shoes should last between 400 and 600 miles, though this depends on your weight, how much you run, and the force you use to strike the ground. Heavy runners who pound the ground every day over long distances will wear out their footwear much quicker than a light jogger who runs once or twice a week. As you approach the “worn out” mileage mark, see how your shoes feel. If they leave your feet feeling fatigued, replace them. Don’t wait until the tread on your soles is worn completely flat, or you’re seeing the midsole showing through the bottom, to replace running shoes. At this point you’re already damaging your feet with insufficient support. If you have pain in your lower limbs when you run, have them examined. To make an appointment you can call our offices where our friendly staff is waiting to assist you or you can submit a request online by clicking on the MAKE AN APPOINTMENT button at the top of this page. « How Does the Laser Treatment Work?